Track loaders from Manitou comprise a range of high performance material handling equipment that can safely lift up to 4 tons of material up to 3.2 m over rough terrain. With industry exclusive tensioning systems, track loaders offer better stability, traction and prolong the lifespan of your machine! Manitou has introduced the viable and versatile radial-lift track loader from American manufacturer, Gehl. AUTO TENSION helps maintain proper tensioning during operation and releases tension when engines are turned off. This helps to prolong the lifespan of track loaders. This design also helps to simplify track service on-site. Enabling track loader operators to tackle any terrain with a choice of 5 personal parameters that suit varying applications. For advanced weight distribution, this chassis enhances stability, grading, traction and ride control. Sensors detect load weights and adjust the hydrostatic drive pump electronically increasing productivity by minimising downtime. With pressures of up to 207 bars, track loaders have fast cycle times. Cylinder cushioning also provides smoother operation when lowering the lift arm. Large gas spring-assisted engine covers, with tilting ROPS and FOPS, allow for easy access for services and repairs. A patented tilt-out foot pad allows for better foot well cleanout and easier access to components under the cab. Cab-forward designs allow for great visibility of the bucket cutting edge. Manitou track loaders feature a customisable multi-function display. These collapsible and adjustable armrests provide extra safety and comfort for track loader operators. For precise control, electro-hydraulic joysticks are mounted to the operator’s seat. 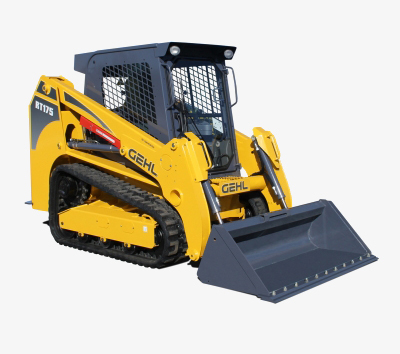 This provides track loader operators with a sealed, cleaner and quitter working environment. Even air conditioning and air filters can be included. 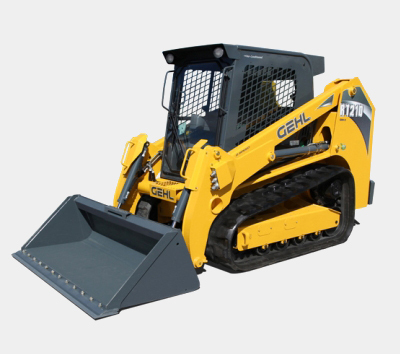 Gehl articulated loaders are versatile and can manoeuvre in and around tight places. The entire range of articulated loaders is easy to maintain, providing more flexibility with every operation and increasing profitability.